Inspired by this Paul Krugman post, looking at data presented on Calculated Risk, I decided to look at the Case-Shiller data for Boston, since they kindly provided the link to the Excel spreadsheet which provides data for 20 metropolitan areas. I can't say I completely understand the index, but it's a housing price indicator that is normalized to the value at Jan 2000 (inflation adjusted as well), that is calculated from repeat sales so that it's more resistant to sampling problems. If real prices of houses in places like LA return to historical norms — and there’s no reason to think they won’t — many, many borrowers with conforming loans will end up with big negative equity anyway, and this in turn will produce a lot of defaults. This crisis is a long way from being over. Now, I'll ignore the the macro question, and leave that to... you know... actual economists and focus on the whether I should expect housing prices to continue to decline near where I live. I am a very happy renter, and am not possessed of the drive to own property as a validation of my existence or as an indication of success as a person... but at the same time it would be nice to be able to paint my walls at least. Maybe get a dishwasher (gasp!). So I've begun to consider condos in the Porter Square area... not too seriously, as we're nowhere near ready to do anything like that... but it would be nice to know whether prices will still be dropping in a year or two. One problem, is that the Boston area used in this index extends into New Hampshire... and I suspect there are differential effects on places within Boston and Cambridge and places far from the city, but you go with what you've got. As you can see, our peak was a lot earlier than most places... hitting in 2006, whereas many areas have only been seeing noticeable declines in the last year. In the same pattern noted by Calculated Risk, the fastest appreciation and subsequent depreciation has been in the bottom two tiers. 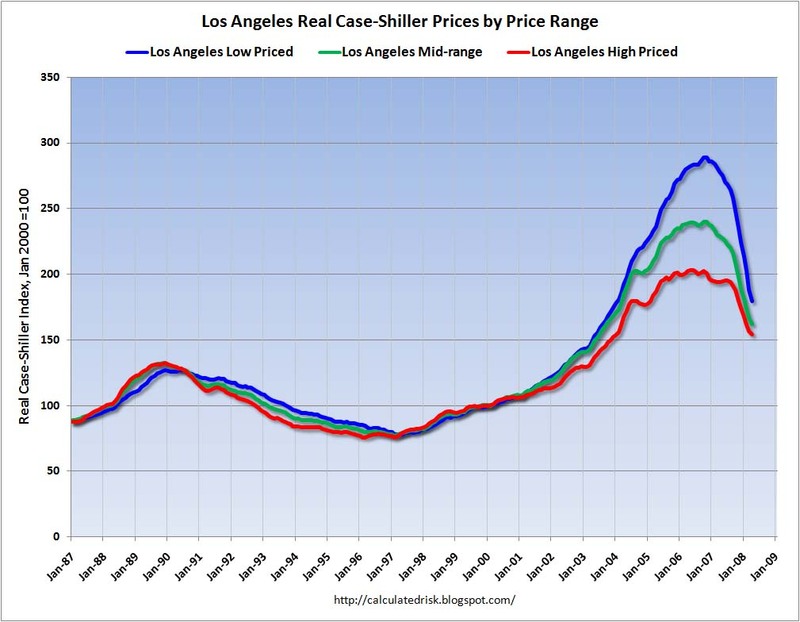 In a number of previous housing busts, real prices declined for 5 to 7 years before finally hitting bottom. If this bust follows that pattern, we will continue to see real price declines for several more years - but if that happens, the rate of decline will probably slow (imagine somewhat of a bell curve on those graphs). However, with the record foreclosure activity, prices might adjust quicker than normal (lenders are less prone to sticky prices than ordinary homeowners). Really? It could be as long as 2013 before prices stop declining? Ouch. It did take 6 or 7 years for Boston housing prices to reach their peak, so it would make sense for it to take equally long to fall back down to "historical norms"... all Gaussian like. The one thing I wonder is how much of this bubble is related to gas being like $1.50 a gallon in 2000 and $4.50 a gallon now? If it's playing any kind of significant role, then I would think houses near public transportation (like where I live) would be less likely to lose value.